Use the Milwaukee 11-in-1 Multi-Tip for a wide variety of driving needs. This screwdriver offers a 5 in. shaft that holds up to nine bits, so you can carry fewer drivers. Featuring hardened tips ranging in size from #1 to #2, it is designed with a rubber handle for comfort and is ideal for wire stripping and bending. Tbook.com crawls the web to find the best prices and availability on Crimpers and related Tools and Hardware products like Milwaukee Ratcheting Modular Crimper. For this page, related items include products we find that match the following keywords: "Crimper" at our vendor partner Home Depot. 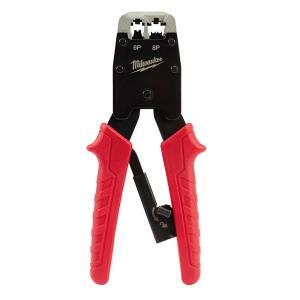 Milwaukee Ratcheting Modular Crimper is one of 41 Crimpers and related products listed in the Tools and Hardware section of Tbook.com If you have any questions on this product, please give us a call at 734-971-1210 during the hours of 9am - 5pm EST for assistance. Thank you for shopping at Tbook.com, the Internet Department Store!